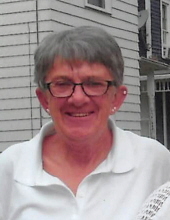 Carol D. Suttles, 65, of Zanesville, died at 10:47 A.M. on Monday, January 14, 2019, at Genesis Hospital Emergency Room, Zanesville. She was born August 2, 1953, in Zanesville, a daughter of Joye (John) King Parks and the late Frank Wisecarver. She retired from United Technologies Company and also worked as a tax preparer at H & R Block and Williams Tax Services. Carol was a member of the Hands of Faith Church and loved her family dearly. In addition to her mother, she is survived by her husband, Clinton Suttles, whom she married December 31, 2013; three daughters, Carrie (William) Harris, Casey (Jeremy Barnett) Suttles, and Courtney (Christopher) Sowers; four step-children, Clinton (Terrie) Suttles, Mark Suttles, Christopher (Brandi) Suttles, and Kristine (Dana) Hammers; twenty grandchildren, Hannah, Kenzi, Octasha, Kiera, Daphney, Delaney, Christopher, Kylee, Jaycee, Langstyn, Lola, Brittney, Cassandra, Marcus, Dean, Madison, Jesse, Slade, Bradley, and Brady; seven great-grandchildren; siblings, Brenda (Fred) Williams, Heather Parks, John Parks, Michael Wisecarver, James Wisecarver, and Jesse Wisecarver; step-mother, Pauline Wisecarver; several nieces and nephews; and friends, co-workers & clients. In addition to her father, she was preceded in death by a granddaughter, Autumn Ulry. Friends and family may call from 11:00 - 1:00 P.M. on Friday, January 18, 2019 at the BOLIN-DIERKES FUNERAL HOME & CREMATORY, 1271 BLUE AVENUE, ZANESVILLE with a Cremation-With-Care to follow. In lieu of flowers, memorial contributions may be made to any Century National Bank in Carol's name to defray funeral costs. To send a note of condolence or to order flowers visit www.bolin-dierkesfuneralhome.com , follow us on Facebook, or call our professional staff at (740)452-4551.